This year, LAFO volunteers applied for documents about the ban of the Warwick WFA1. Freedom of Information applications were sent to the Western Australia Police, Tasmania Police, Australian Federal Police and the Australian Criminal Intelligence Commission (previously called the Australian Crime Commission). It is not any particular item or part of a firearm that categorises it to have ‘the appearance etc’. It is the complete package (appearance). The reasons to classify the Warwick WFA1 as a prohibited firearm is on appearance alone. As to who recommended the WFA1 ban, TasPol told us about the four members of Tasmania’s Firearms Categorisation Advisory Committee who were involved. [Constable C] was not able to disclose documentation in relation to this request as there is no documentation available. Who is the mystery interstate No 3 Member? And why aren’t there any internal documents at all about the ban of the WFA1? Who is the mystery interstate No 3 Member? It is now becoming well-known that the Federal Police (through their Firearms Identification team) and the Criminal Intelligence Commission (through their responsibility for the Australian Firearms Information Network) are working extensively with State Firearms Registries. Freedom of Information applications to the two federal agencies reveal that Tasmania Police sought and received federal help. Mystery member number 3 is an ACIC officer. Where did TasPol’s internal documents go? TasPol say there are simply no documents on the subject. 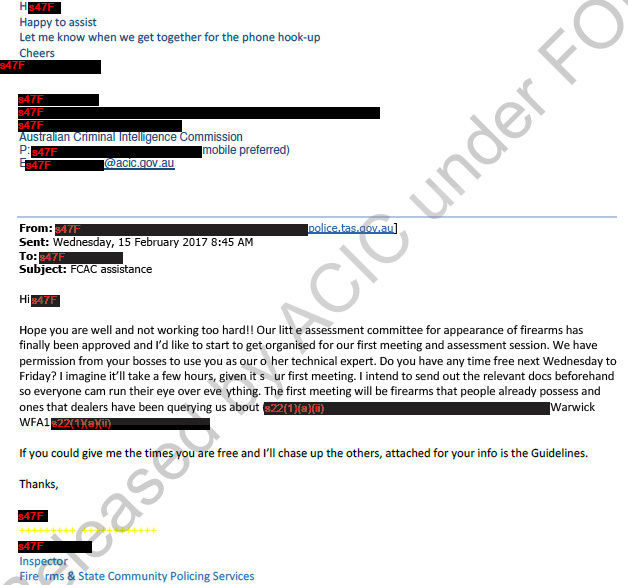 However, the ACIC sent us a schedule of over a dozen documents that they had received from TasPol. There were photographs and an assessment template (you can see a Word document attached to the email below). 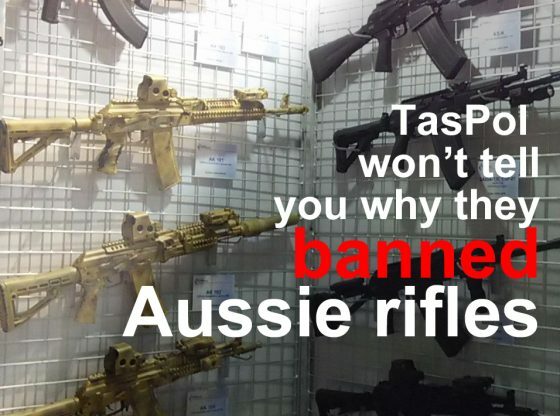 #1 Why do TasPol think they can ban a rifle and offer no analysis to justify their banning of an Australian-made rifle? 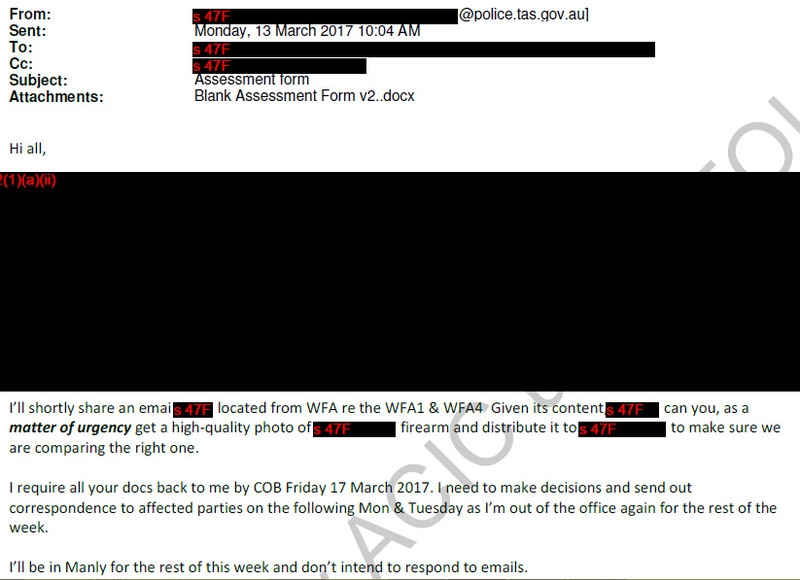 #2 Why are TasPol apparently misleading the public by insisting there are no documents on the WFA1 ban? #3 How long will politicians let bureaucrats get away with this? Answer for #3: until you change the politicians.